Apple knows how to design user interfaces so that you are hooked. Let’s take iCloud setup on Mac OS X for example. I was figuring out how it works and taking it to use for the first time. 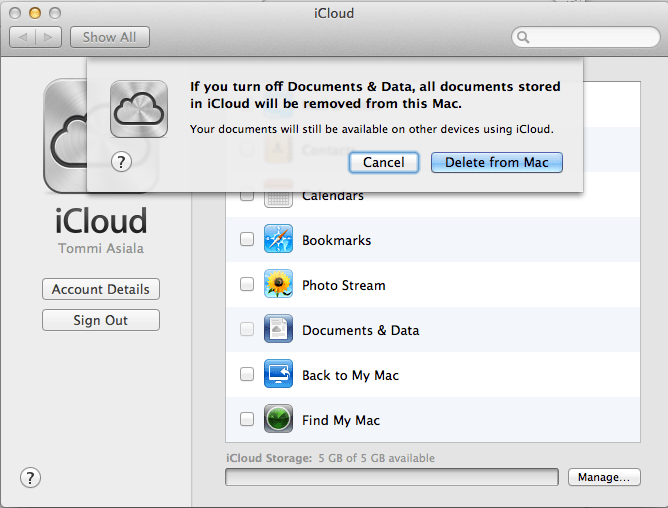 The iCloud preference dialog stated there was 5 GB available and that my Documents & Data was selected. My first reaction was that I don’t want to sync all my Documents & Data – I was just want to figure out what this and if I could use it for syncing iPhoto. I clicked on the Documents & Data to disable it. What are you removing from my Mac? My Documents folder? Lesson: if the user tries to stop using your service then make vague threads about deleting user’s data to ensure loyalty. Yesterday I attended a Houston Inc dojo. It was the second dojo I have ever attended and a very well organized one. To me, the most valuable lesson was how as a team we tend to go for features instead of refactoring. Sure, everybody said afterwards that they refactor more in real life but why didn’t they do it now? The benefits of refactoring can be seen so fast, certainly in a four hour session. One of the bugs in the dojo product was caused purely by from lack of refactoring. I watched Paul Graham’s keynote from PyCon US 2012 where he talks about replacing universities among other things. The traditional mentor model of teaching and learning in IT industry has been on surface lately. I see a gap here in Finland between mentoring in companies and some university mentoring programs which could definitely be filled. Instead of personal trainer you would have a personal mentor regardless of your company and education. Make a product out of mentoring. 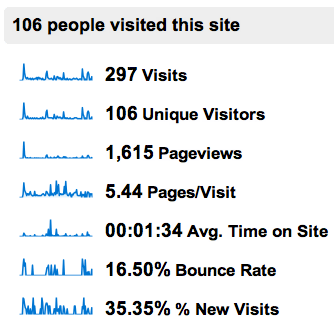 I started writing my training blog on October 29th 2011 and tracking the user visits with Google Analytics since December (statistics shown on right). Total of 54 posts about my physical fitness. Resistance is certainly not futile but I am still assimilating the Treeniblogi2 to my renewed, WordPress and Markdown driven blog. There are multiple reasons why I am doing this, but the biggest reason is psychological. Physical fitness is part of me. To embrace it you have to live and breath it. If you want to something be part of you, it can’t be something separate. 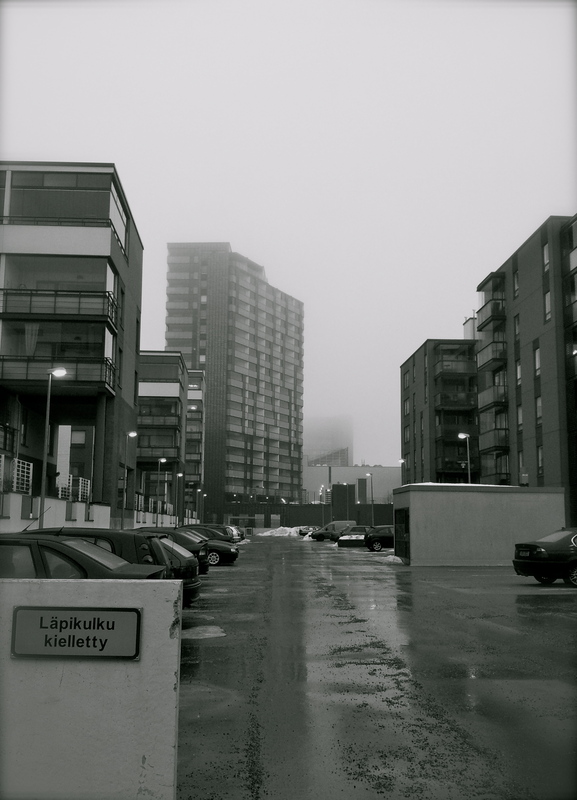 To me Treeniblogi2 has filled it’s purpose as a stepping stone for keeping track of my activities and as a place for reflection. I will continue to post training entries but the format for those is yet undecided. Scan Agile 2012 conference was held on Thursday 8th of March. Great day which really made a difference. Here’s a small summary of the talks I went to. While I had the pleasure of meeting Venkat Subramaniam fall 2011 through a Sysart Hotspot event and knew about his excellent presentation skills, I was skeptic about the refactoring topic. Would I benefit from yet another one short refactoring lesson? In short, I did benefit. The approach was on the motivation of refactoring, not on the how part. Nothing really new, but repetition is the key for learning. He also pointed out a book called On Writing Well: The Classic Guide to Writing Nonfiction by Zinsser which is said to apply both natural and programming languages. I just ordered it. Joseph talked about Cynefin. While interesting I felt the talk could have delivered more by giving examples and advice on applying the Cynefin. Kati talked about creating a continuous improvement culture. Feedback loops, safety to fail and empowerment were among the topics covered. Loads of good of information. When did you feel full of energy in your work life? The talk was in the rough stages and perhaps I wasn’t the main audience for it. However, the searching for examples and producing a model an “Olaf” with “Bob” for understanding the system was something which will stay in my head for a long time. Marko showed four cases of fuckups. Queues and visualization were the main points I got out of it. 20 minutes of Aivobic from a funny PersonalBrainer. See the following video http://www.youtube.com/watch?v=2-9efXeMuRI. Like many others have said, the best thing which I got out of Scan Agile 2012 was the encouragement and enthusiasm. 60 minutes was too long for most of the talks. Perhaps we’ll see shorter ones next year? Afterparty with free drinks was great of course.